One thing I really think should come back into fashion is the hand fan! They're beautiful, practical, and romantic... Here is one from Fabergé. Made by workmaster Henrik Wigström. 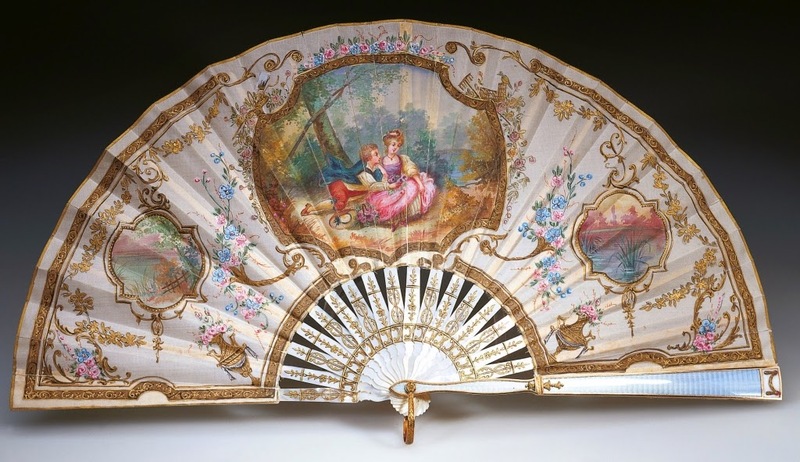 The beautifully painted fan has a leaf of plain weave silk, backed with silk gauze. The 8.5'' (21.6 cm) front guardstick is made of mother-of-pearl, covered in white and blue enamel over a guilloché ground, and decorated with two-colored gold and two Burmese cabochon rubies. The back guard and the rest of the sticks are also of mother-of-pearl. The fan still has it's original birchwood box, and it was purchased by Queen Alexandra in 1912 as a Christmas present for her daughter-in-law, Queen Mary. Now it has it's place in the Royal Collection.